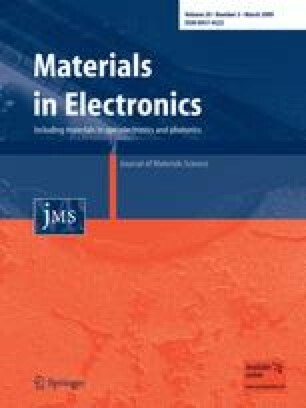 Intrinsic resistivity and carrier transport parameters of sintered nickel manganite samples (NTC thermistor grade) were determined using a Hall effect measurement system based on the van der Pauw method. Powder mixtures composed of MnO, NiO and with small amounts of CoO and Fe2O3 were free surface energy activated by milling in an ultra fast planetary mill for 5, 15, 30, 45 and 60 min. The powders were uniaxially pressed with 196 MPa into discs and sintered at 1200 °C for 60 min. Full characterization of nickel manganite samples was done using SEM, EDS and XRD analysis. The Hall effect was measured at different temperatures (room temperature, 50, 80, 100 and 120 °C) with an applied field of 0.37 T and also 0.57 T at room temperature. The activation energy E a (energy of conduction) and the coefficient of temperature sensitivity B 25/80, were calculated from measured resistivity values. The measured mobility, resistivity/conductivity, U-I plots, and Hall coefficients were mutually compared and correlated versus microstructure development and macroscopic parameters such as the powder activation time and ambient temperature. We would like to express our gratitude to Dr Goran Branković for SEM measurements. This work was performed as part of project 6150B financed by the Ministry for Science of the Republic of Serbia.